Rossland Museum, Discovery Centre & Visitor Centre - The site of the LeRoi Gold Mine displays a collection of artifacts, a Geology Centre and offers gold panning. First discovered by two prospectors, the LeRoi mine claim started the gold rush in Rossland. (1890-1934) Known as the 'Golden City', the LeRoi Mine produced more gold than all of the creeks and rivers of British Columbia, totaling nearly $30 million dollars. The Rossland Historical Museum is located on the site of the LeRoi Mine. Today, visitors can enjoy a guided tour of the LeRoi Mine site, the Geology building, the wonderful collection of artifacts and try their luck at gold panning. 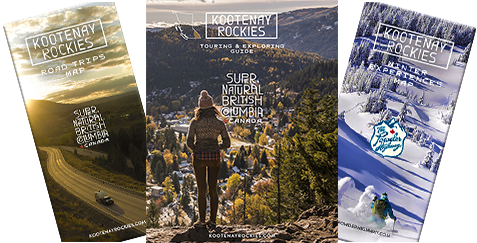 The museum offers displays on local history, Cominco, West Kootenay Power, Skiing history and other interesting exhibits and photographs depicting the early history of Rossland. Museum open July & August, 7 days a week, 10 am to 6 pm; mid May to end of June, Tuesday through Sunday 10 am to 5 pm; September through to mid May, Wednesday through Saturday noon to 5 pm. School/Group Tours & Facility rentals within or outside of regular hours may be available throughout the year. Please contact for more information. Tours of the facility grounds take place daily in June at noon & 2 pm; July & August daily at 11 am, 1 pm and 3 pm. Tours are approximately 1 hour in duration including gold panning demonstration. Please contact for group tours at other times. The Geology building offers an introduction to mining history and the geology of the area. It has cases of igneous, metamorphic and sedimentary rocks - an extensive collection from all over the world. There is also geologic and processing equipment, and a hands-on rock specimen display. The industrial mineral collection shows the importance of minerals in Canada's history. Also, located at the museum, the office provides travel information - brochures, maps and free WiFi. It's a great place to stop, rest, relax and have a stroll around to check out this heritage attraction. Snacks and ice cream available during the summer; coffee, tea and hot chocolate available year-round.